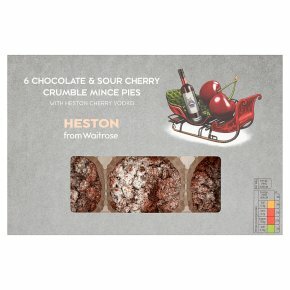 A sublime combination of indulgent flavours make these mince pies both unique yet unmistakably festive. They're a great gift idea too - if you can bring yourself to part with them. INGREDIENTS: Mincemeat (37%) (vine fruits (sultanas, raisins), cherry curd (sugar, wheat glucose syrup, concentrated cherry juice, modified wheat starch, palm oil, rapeseed oil, acidity regulators (malic acid, sodium citrates), gelling agent (pectin), acetic acid, dextrose, colour (anthocyanins), flavouring, water), sugar, apple pulp, butter oil (milk), sour cherry, kirsch, lemon zest, orange peel, free range dried egg, Heston cherry bakewell vodka, wheat starch, mixed spices, salt, cherry juice, concentrated lemon juice, ameretto), wheat flour, sugar, butter (milk), dextrose, fat reduced cocoa powder, glucose-fructose syrup, raising agents (diphosphates, potassium carbonate, ammonium carbonates), wheat starch, soya flour, salt, emulsifier (soya lecithin), palm oil, flavouring.